Tabouli salad is the darling of all Mediterranean salads. Not for its simplicity only, but for its rich and tangy flavors. A handful of ingredients and you are off to an edible garden right on your dinner table. Tabbouleh salad is my absolute favorite salad to make and eat, in the Levantine area, no banquet or gathering is completer without Tabulah. 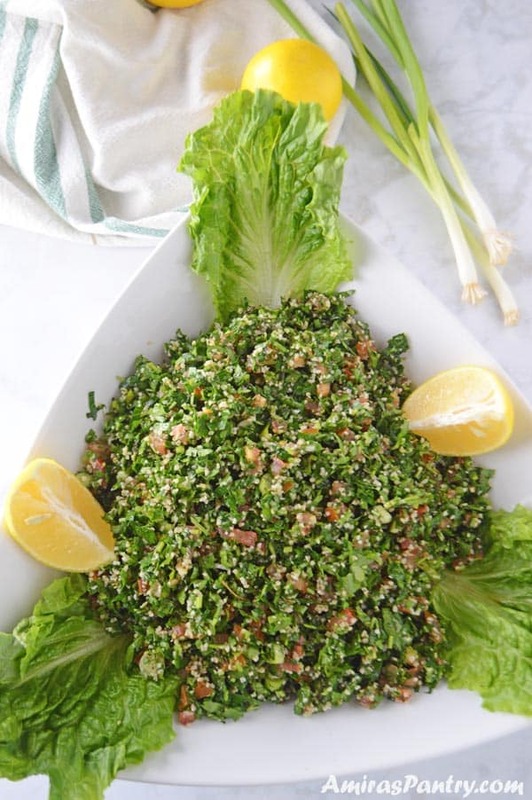 Scoop Tabouli, the traditional way with Romaine lettuce, or simply enjoy it with a fork. Delicious, lemony and full of addicting earthy flavors. Best served with grilled meat(s) such as this juicy kofta kebab. I fell hard for this salad when I was just 9 years old!. It is strange that I got hooked at such a young age. This shows you how much I am into lemony dishes. Tabulah was not popular in Egypt back in the early 80s. We were at a Palestinian’s friend house for dinner and she made it, my mom happily left with a recipe that has been a favorite since then. These days you can see lots of Tabouli recipes online, with quinoa with couscous and even one with apples!. These were the words of one angry Lebanese friend, who is thinking that Tabouli is being abused on the internet. Although I am a fan of recipe renewal and thinking outside the usual, challenging yourself ans stepping out of boundaries. She got a point guys, all those other recipes should say ” Tabouli inspired” :). 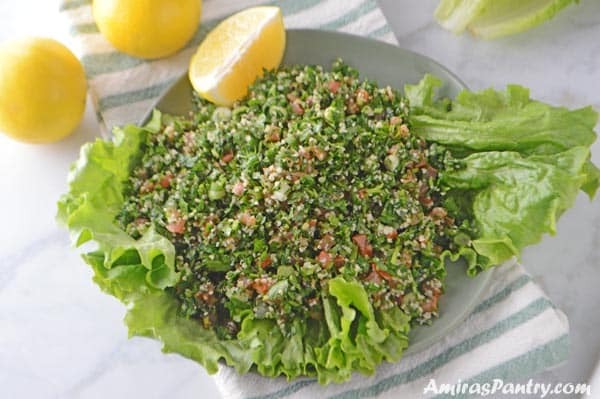 Tabouli is known for being a healthy vegan recipe that is loaded with fibers, minerals and healthy fats. The fat in the olive oil is unsaturated fat hence it is not the harmful one. How do you eat tabouli? 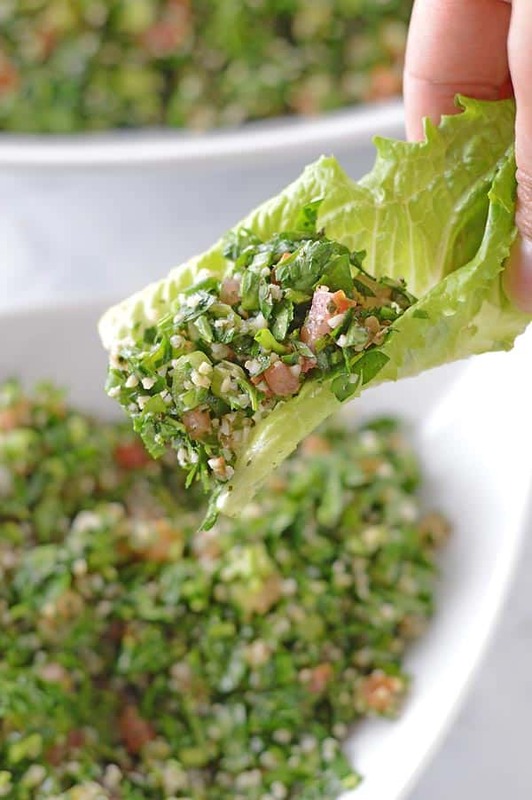 Traditionally, tabouli is scooped or wrapped in Romaine lettuce. You can also have it with a fork. It makes a great side dish with falafel and also grilled meats. 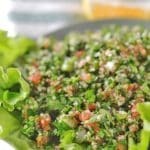 Is tabbouleh served hot or cold? Cold, I’ve never seen it served hot or room temperature. It is always chilled. If you have sensitive teeth though, you can serve it room temperature. Do not use food processor: When it comes to chopping Tabouli, no one can beat my mom, really she is a pro in this. I do not know how she does this but she can chop parsley very very finely- of course her kitchen turns into a mess afterwords. Being always busy with my work back in Egypt, when I tried to make tabbouleh I used my food processor trying not to make a mush out of the parsley. So never, never ever use a food processor, this was very offensive to my Lebanese friend when she knew . Do not add cucumber: this one was really a surprise for me.. what!! no cucumber. She told me you can add cucumber but don’t you dare call it tabbouleh, tabbouleh salad does not have cucumber in it. Do not use pomegranate molasses: well, usually I do not, but I know people who do use it like my sister. So for tabbouleh use only lime juice. 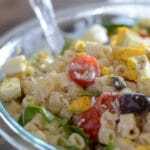 Do not soak bulgur: yes, this was another surprising fact about authentic tabbouleh, bulgur should only be rinsed several times and that’s it. 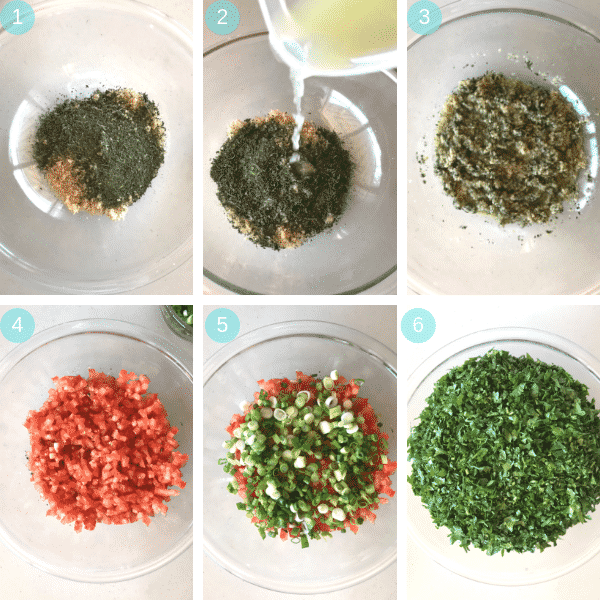 Add salt only before serving: when you add salt long before serving you’ll find tabbouleh swimming in a puddle of water and the veggies will be soggy , parsley and mint will not look wilted. Use hard tomatoes and chop everything finely:chop onions and tomatoes finely and try to use the hardest tomatoes you can find. 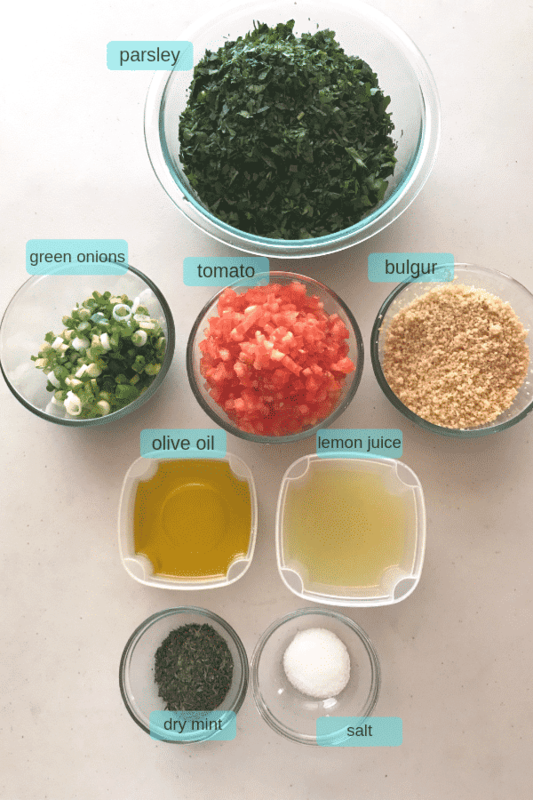 How do you make Tabouli? In the bottom of a large bowl, combine washed bulgur with dry mint if using. Some people like using special Arabic spices i.e “Baharat”. Pour over the lemon juice. Mix bulgur, mint and lemon juice well together. This was the bulgur is soaked in lemon juice and not in water which will give it a distinct taste. Add finely chopped tomato as a layer over the bulgur and do not mix it in. Tomato will release water which will also acts as a soaking liquid for the bulgur. Layer green onions on top of the tomato layer. Finally top all those with a huge layer of parsley. Again do not mix anything. Cover and refrigerate. Before serving by 30 minutes to 1 hour, take the bowl out, uncover, notice how the parsley and veggies are not wilted? Add salt to your liking but I highly recommend the amount I went for. Tabouli should be a bit salty. Pour a hefty amount of olive oil over. Now make sure to mix everything well together. Cover and refrigerate until you are ready to serve. This vegetables chopper helps me a lot around the kitchen and I’ve used the small blade for veggies in this recipe. Taboui salad, is a famous recipe in the Lebanese cuisine. 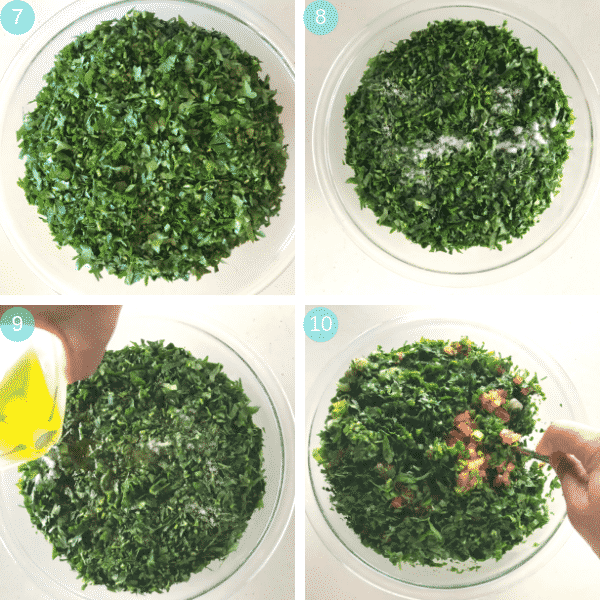 Tabouli is a labor of love as it requires a LOT of finely chopping. 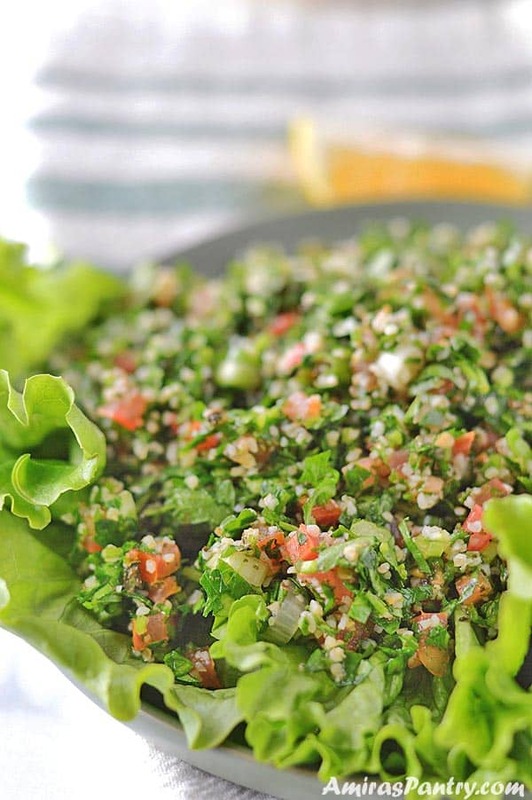 The most famous recipe in the Lebanese cuisine, Tabouli salad. A wonderful salad to accompany your grilled meat. 1/2 cup (70g) fine #1 bulgur wheat. 2 Tablespoons (4g) dry mint. (Note2). 3-4 firm Roma tomatoes finely diced. 5 green onions (65g) cleaned trimmed and sliced (white and green). 3 bunches (330g) fresh flat-leaf parsley, finely chopped. 1/2 cup (120ml) olive oil. 1 1/2 7g teaspoon salt. Wash bulgur thoroughly, do not soak, drain. Place in a deep bowl. Layer the other ingredients as follows, tomatoes, green onions and parsley. Let it set for about 30 minutes. Add salt and oil, mix everything well together and refrigerate for at least an hour. Before serving by one hour, add salt, oil then mix everything well and refrigerate again for 1 hour. Serve with romaine leaves or eat it by a fork. Note1: Be aware that lemon juice tartness fades over time, meaning it will be so tart if you used it right away. But it was just perfect the next day. Note2: You can use 1/3 cup finely chopped fresh mint leaves. Note3: Some people like adding Arabic Bharat to the bulgur as well but I like it with only fry mint. My mom is Syrian, she does the same thing as you do by soaking the bulgur in lemon juice. Oh I am drooling here. Glad to find your recipe with exact measurements. Awesome Talia, I’m so glad you like it! 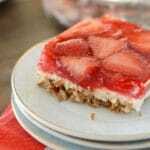 Made this once with barley and once with quinoa too was a great way to consume healthy grains. I’m looking forward to playing with it even more. Glad to hear you enjoyed this Willem ! Thanks for letting me know. This was very tasty, I have a lot of parsley from my garden and this is my favorite way to use them up. Great recipe. Katie, this is awesome, I love gardening too. Unfortunately the season here in Colorado is so short. Hello, I am new to tabbouleh salads, so my question mind be silly, you are using uncooked Bulgar grain? Angy, no silly questions here … we are all still learning dear :). Yes, you are right, the bulgur is uncooked. If you have any further questions please do ask. Jessie, sure thing. I’ve found loads of recipes shared among these three countries and add Jordan to them too. I love their cooking and almost all the recipes.Thank you for your comment. Hahaha I like your oath :). Actually, every cuisine has its own characteristics, up until this moment I do not like Thai, but I am sure that I am doing something wrong with the recipes as so many friends recommended it. Thanks for stopping by. I had to smile as I seem to be doing more right than wrong. I’ll have to try adding the dried mint in addition to the fresh. Good tips! And I often don’t use the food processor when I make tabbouleh. But sometimes I do. Sorry to anger your friend. 🙂 Anyway, fun read — thanks. The hardest part is the chopping Amira! It is hard and takes a lot of time. But whu not use this time to meditate while preparing a lovely dish. I love Lebanese Tabouleh and I will use your tips for the next one. What a lovely idea and I totally agree chopping is the hardest part in the tabbouleh :). This is what I love about food…learning new things daily….sharing!